In love with your phone? Can’t go a second without having it hot-glued to your body? 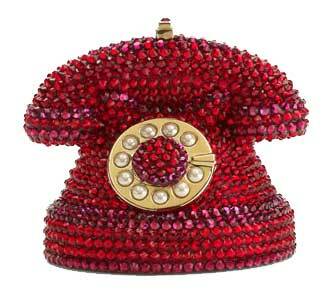 Check out this new minaudiere from Judith Leiber – the reigning queen of shiny, sparkly, whacky evening bags. Enveloped in glittery Austrian crystals, with a removable 19″ chain strap, Napa leather lining on the inside, a crystal-encrusted push clasp and the signature Judith Leiber plaque, it’s gorgeously retro and sure to stand out in the sea of iPhones and Blackberries that surround us at every turn. Plus it’s adorably eye catching. 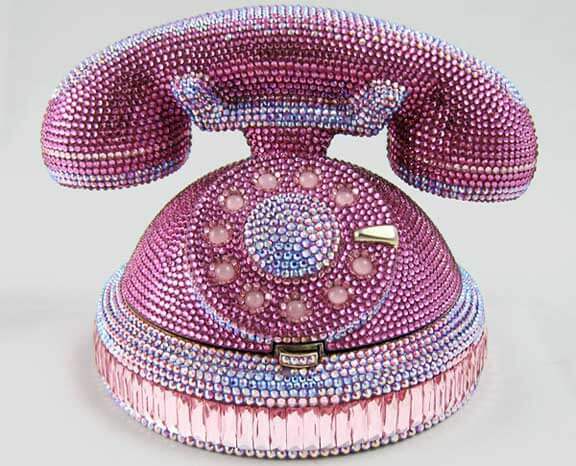 In fact, if Barbie was alive and had a house phone in her mansion, I’m sure it would look just like this! It costs $5695 and there is a mini version available for $495. Which one would you pick?